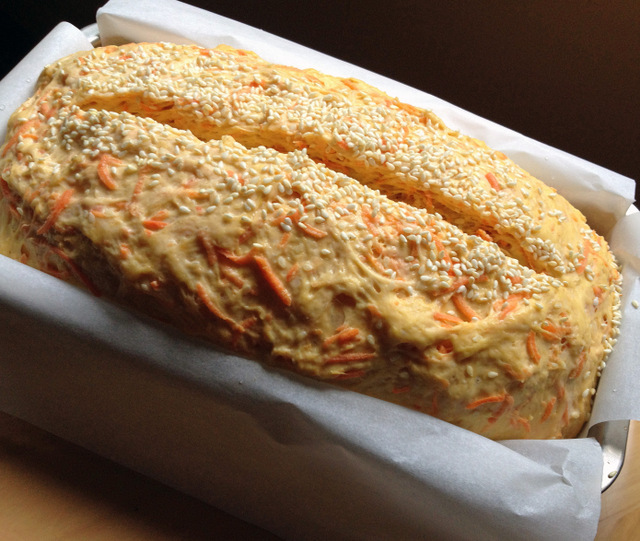 From the one and only Dan Lepard, a loaf to satisfy your cravings for a hearty sandwich bread, with the slightly nutty flavor of sesame seeds and a very subtle sweetness from grated carrots in the crumb. Very easy to make, very easy to love… You can find the full recipe on The Guardian site, by clicking here. 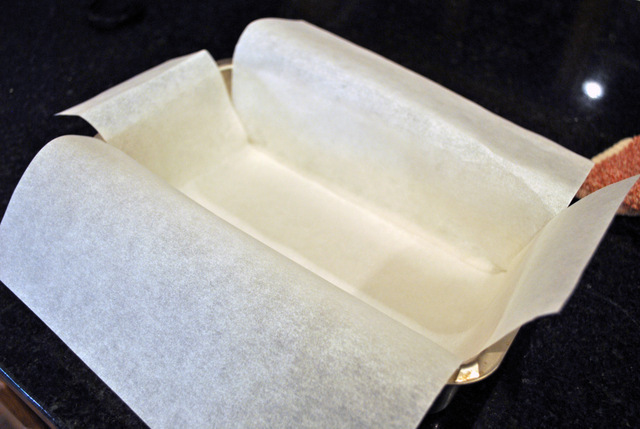 Here’s a little virtual tour of the process, starting with a quick preparation of your loaf pan. You might be surprised to learn that I am a complete disaster when it comes to using scissors. I cannot make a straight cut to save my life. So I was proud of my job here, although truth be told, it took me almost 15 minutes to do this. 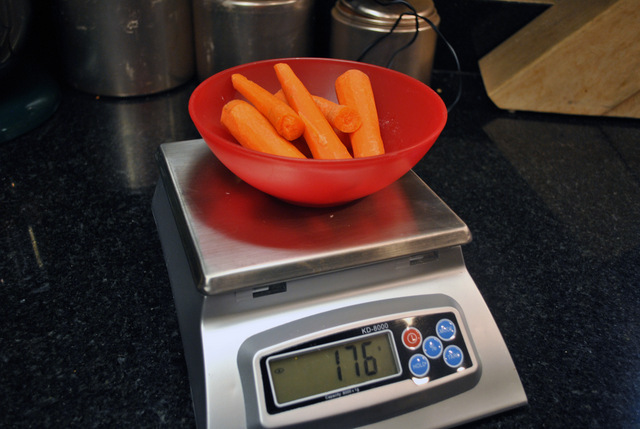 The carrots are very evident in the dough, but they get baked into the crumb in a wonderful way. 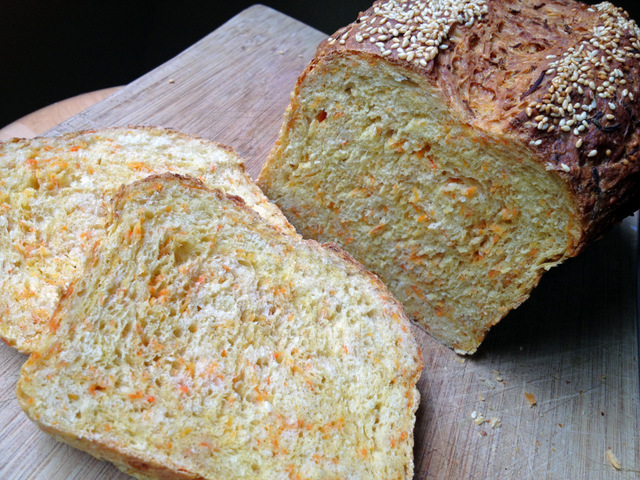 They won’t disappear, but you won’t feel any harsh bits of carrots as you bite into the bread. 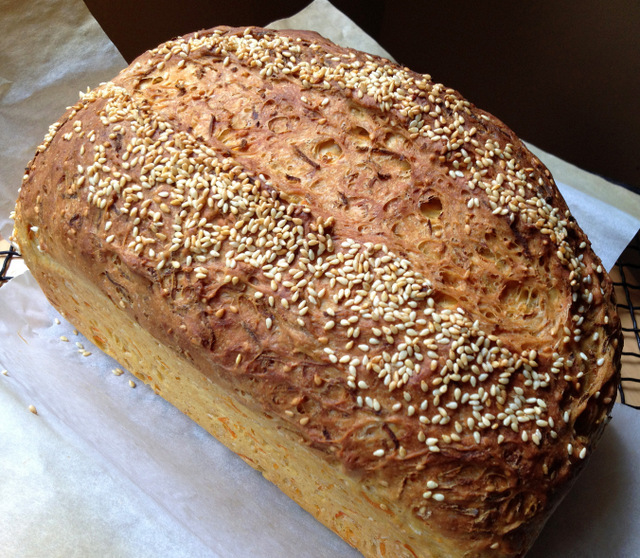 A very soft crumb, with a nice crunchy top given by the sesame seeds. Make sure to follow Dan’s tip on adding them: wet the surface of the slashed dough with a little water so that the seeds can stick better. He used black sesame seeds, for quite a dramatic look. I could swear I had black sesame seeds somewhere, but I could not find them, so I used regular, white seeds. 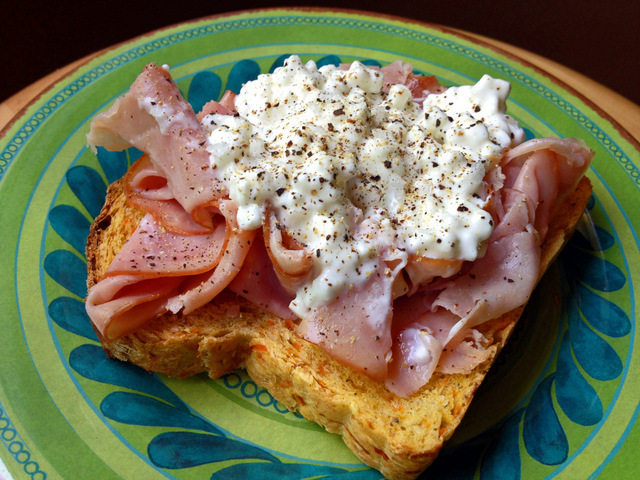 And I share with you a favorite lunch option: an open-faced sandwich made with this bread, slightly toasted, some smoked ham, and cottage cheese with enough salt and black pepper to make it all shine… Perfection, if you ask me! TWO YEARS AGO: Goodbye L.A.
Sally: Que delicia!!! Ai quem dera ter varias fatias desse pao de cenoura para comer com requeijao!!! I think it’d also be great to make a sanduiche natural with this bread. Have a great Sunday!!! Had my hand out to click the ‘off’ switch when this arrived 🙂 ! Now, I am very definitely NOT a baker but this looks so good and so easy and has so many of my favorite ingredients and I honestly and truly can cut anything, including paper, straight 🙂 ! So am very definitely going to try!! Leave you with a smile: being born in N Europe and still having atavistic tendencies, ALL my sandwiches are open-faced and one like your photo is my usual brekfast with black coffee! Huh 😉 ! One is supposed to eat ’em with a fork and knife!! Oh well, from a ‘peasant’ country[ies] and all that !!!! [my apologies, could not help myself!!!]. . . .
Wow! That is one amazing loaf of bread! Sawsan, I thought of you when I saw that variation on the site, that bread has your name written all over it! All recipes from The Guardian, at least the ones from Dan include a “now try this” which takes the basic recipe into a new direction. I really enjoy that site. You can browse countless breads in there, for the most part quite simple. I don’t think he includes sourdough in The Guardian, but I could be wrong. The first great bread is like the first olive coming out of a jar: all others will be easier and better! Oh Sally, that last photograph really got me! I shouldn’t have come here hungry. Now all I want is homemade bread piled on with toppings! This is such a unique recipe and one that I’m now eager to try. Thank you for sharing! You’re funny. I can’t do scissors, either. Beautiful looking bread! We should start a club with a membership and all… Scissors-Challenged, unite! Joanna, this is music to my ears! I HATE recipes that call for the paper lining, and usually start moaning when I read that part. That is often enough to make me search for another one, but… this bread was impossible to resist. Ah, Sally, I had to work through lunch today and you have no idea how much I want a slice of this *gorgeous* bread right now. 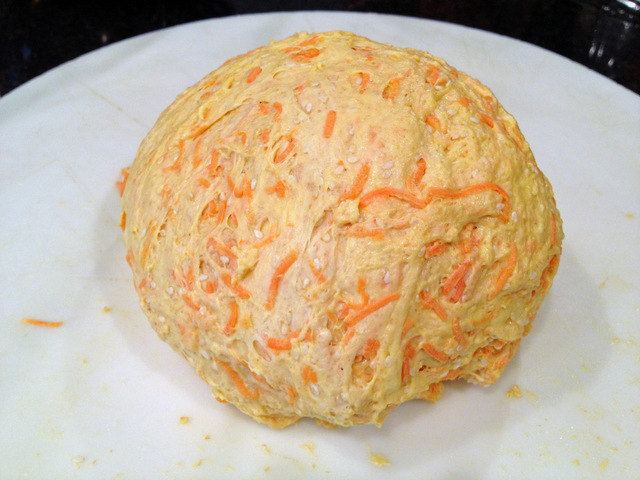 Just look at those flecks of carrot and does your cottage cheese ever look perfect with this too… yum! Another incredible-looking loaf, Sally. 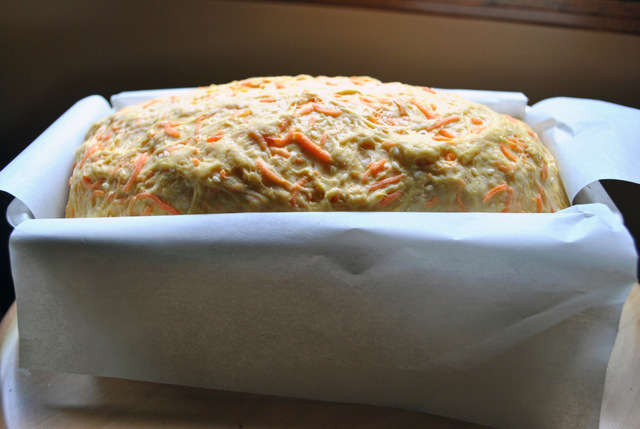 The carrot streaked crumb looks delicious! So good to see I’m not the only one to like my cottage cheese sprinkled with pepper. I’ve had more than one lunch companion look at me like I was out of my mind when they saw my cottage cheese. I didn’t care then and don’t care now. It is simply the best and only way to eat cottage cheese. I can only imagine how good it would taste atop that open-faced sandwich of yours.